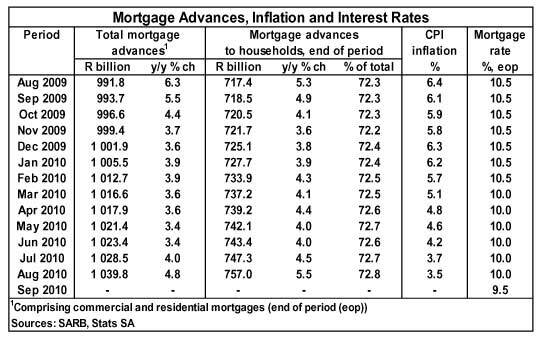 Based on data released by the South African Reserve Bank, the total value of outstanding mortgage balances at monetary institutions, which includes both commercial and residential mortgage loans, accelerated by 4,8% year-on-year (y/y) in August 2010 after growing by 4% y/y in the preceding month. On a monthly basis outstanding mortgage balances were up by 1,1% in August, from a growth rate of 0,5% recorded in July compared with June. 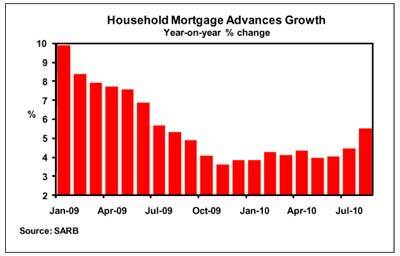 Outstanding mortgage balances in the household sector increased by 5,5% y/y in august after rising by 4,5% y/y in July. The August growth rate was the highest since July 2009 when it was 5,7%. Month-on-month growth was 1,3% in August (0,5% in July). 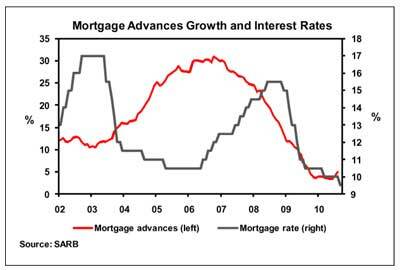 The lagged effect of lower interest rates appears to have positively affected mortgage advances growth over the past two months, with the further rate cut in early September expected to provide some further support to the housing market and the demand for mortgage finance over the short term. 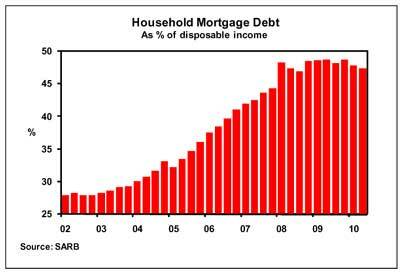 The ratio of outstanding household mortgage debt to disposable income was slightly lower at 47,4% in the 2nd quarter of 2010 (47,8% in the 1st quarter of the year). This was the net result of trends in the growth of household mortgage debt (1,2% quarter-on-quarter (q/q)) and nominal disposable income (2,0% q/q) in the 2nd quarter. 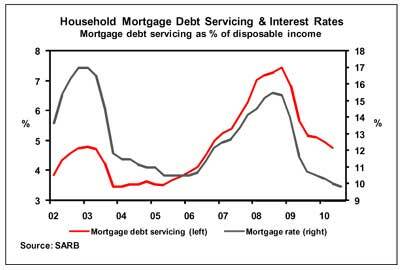 The cost of servicing household mortgage debt as a percentage of disposable income declined to 4,7% in the 2nd quarter from 4,9% in the 1st quarter. This was due to the abovementioned trends in the growth of household mortgage debt and disposable income, while the mortgage interest rate was on average somewhat lower in the 2nd quarter than in the 1st quarter, after rates were cut by 50 basis points in March. Year-on-year growth in mortgage advances to the household sector is expected to remain in single digits up to the end of the year.